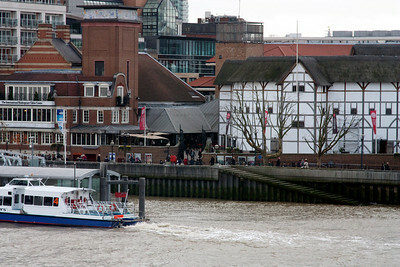 Visiting Globe like a bystander is perhaps just a little sad. Completely omitting the trip would have been even sadder. I chalked this one up to one of the downsides of visiting London in the winter. It helps a little if you pretend it to be a reconnaissance mission. 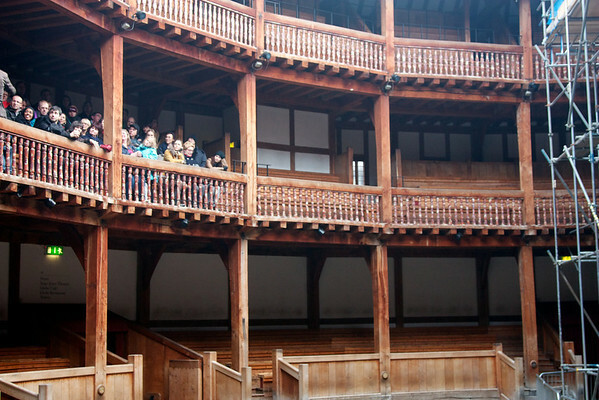 So, what is it that you can actually see if you are not attending one of the theater’s productions? 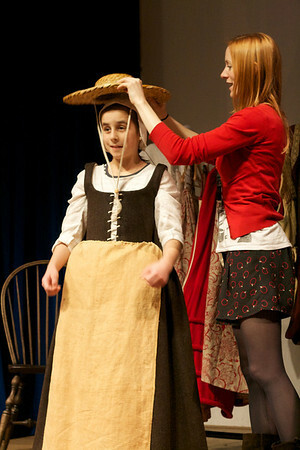 Being dressed up as a peasant girl by our school mistress guide. They have a tour of the theater that we took. It does cost a little but in a city where most of the major museums don’t cost a penny, I wasn’t complaining. Our guide was a bright young woman who was extremely efficient about imparting a vast amount of information with a hint of school mistress brusqueness. The theater space is indeed intimate and beautiful at the same time. I suspect that the closeness between the performers and the audience allows for an immersive experience. 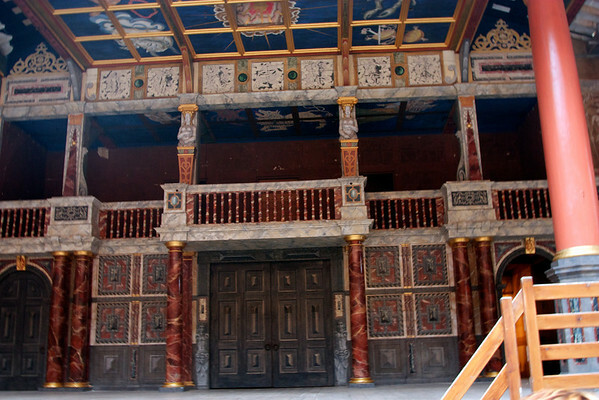 If I am lucky enough to attend a production here on a balmy summer evening, I am sure to go for the pit, the standing ground in front of the stage, armed with peanuts and a rain jacket just in case. Our tour ended at the outer courtyard where names of Globe benefactors are engraved on the tiles. Our guide pointed out couple of tiles paid for by John Cleese who paid on the condition that Palin’s name would be engraved incorrectly on one – either pure English humor or some in-joke that only the Monty Python troop is laughing at. At the conclusion of the guided tour, one is free is walk about the rest of the theater space. 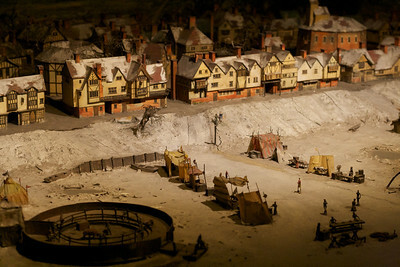 They have a museum inside that showcases landscape models from the Shakespearean times as well as items of clothing and weapons. 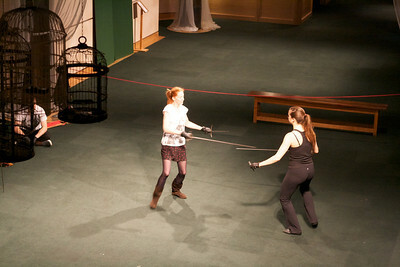 There was an informal sword fighting class in progress. We also happened to catch a live show where a young girl, one of the visitors perhaps, put on peasant clothes from that era. The theater shop has bits and pieces of curios where I ended up with some Shakespearean buttons. 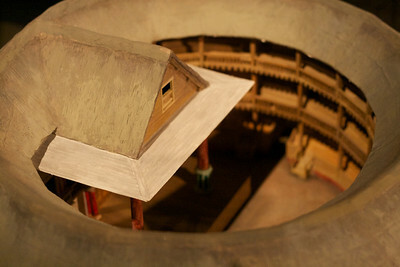 Globe theater from inside. Another tour group can be seen. The center stage is being renovated during the off season. Center stage for performers. Above the performers are the seats for the Royalty.